Today I’m having a look at the Sony Tablet S. One of the newest Android tablets on the market, this device really sets itself apart from the competition in so many ways. Let’s look at some of the best and key features on the Sony Tablet. 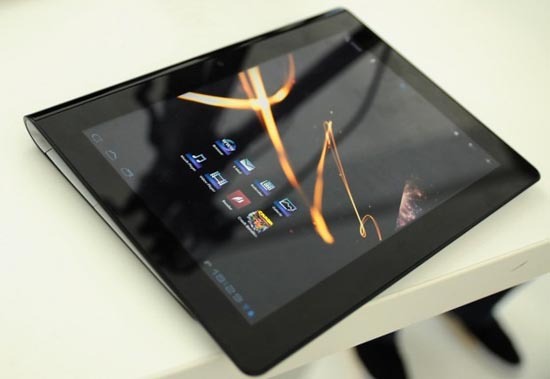 At first glance, it’s one of the most uniquely designed tablets, with a nice folded and slanting design which creates a much more comfortable usability and browsing experience. The slanted design cleverly hides the huge host of ports, which allow you to connect more devices and share data seamlessly. These include; volume buttons, data ports, SD Card slots, mini USB port, IR Port, headphone jack and power port. This all gives the device a nice seamless look, without distracting you with various buttons and slots from the screen. 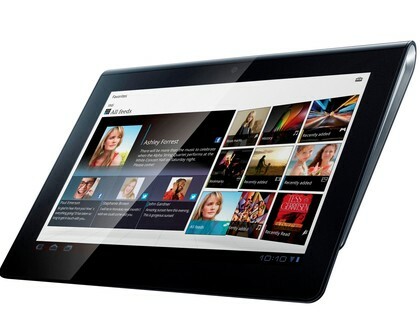 The screen itself is a gorgeous 9.4″ gloss screen with a 1280-800 resolution. Under the (very) sleek hood, this tablet is packing a lot, with; 1GB of RAM, 16GB of storage, an impressive NVIDIA Tegra 2 processor, gyroscope, DLNA technology and a front and rear facing camera not to mention a solid 8 hours of battery life with standard usage. You really can take everything with you wherever you go. The true black, 9.4″ screen also means that you can browse websites, magazines, newspapers, photos and movies with a crystal clear image in stunning quality. But it isn’t just the hardware that’s impressive. Running Android’s powerful 3.1 Gingerbread, with the option to upgrade to 3.2, this is not only a well designed tablet, it’s also easy to use for a host of different things to suit whatever you need to do. The user interface is sleek, clear and easy to navigate, offering all of your most important apps right where you need them. There’s already a lot of handy apps natively installed on the tablet, including YouTube, Gmail (with an improved interface) and the Android Marketplace which allows you to download any of the thousands of apps available there such as the Universal Remote Control app, allowing you to take control of any of your home devices. The build-in browser offers a web experience, which is second to none, offering full Flash support so that you can see the web as it’s meant to be seen. Sony Tablet is also Playstation certified, meaning that you can play your favourite titles with ease from the online store. This is probably one of the biggest selling points for the app, and really is the big draw for Sony to play on. The iconic and powerful brand really adds weight to what this tab really is all about and helps attract some of the more serious gamers away from the likes of the iPad, which already has a growing reputation for more and more advanced games. While the Sony has made a really solid attempt at a tablet, there are a few drawbacks; my big one is the shape. While I genuinely find it actually quite attractive, the teardrop slant means that portrait is very uncomfortable, and I like my tablets (along with a lot of people) in Portrait mode, for magazines and newspapers particularly. The other is the overall interface, coming from iOS to Sony’s Android interface; I found it comparatively messy, lacking the organized simplicity that comes naturally to Apple products. While I won’t be ditching my iPad anytime soon, as the app environment is still that bit ahead of Android, the Sony Tablet isn’t a bad start. But with Amazon having jumped in the game, Sony really have lost out, and it’s a shame as this really is a nice product.